Note: Since EquiLesson is web-based, it allows your customers to see your schedule of lessons on-line anytime; allows them to reserve lessons on-line anytime; allows them to even pay on-line anytime! Who Can Benefit From Using EquiLesson Software? If you are in a horse business that involves teaching lessons to students, whether you are a Riding School, Private Instructor, Dude Ranch or Summer Camp, EquiLesson can take the business worry out of your life and allow you the time you need to do what you do best— teaching riding! How Does EquiLesson Help Instructors? 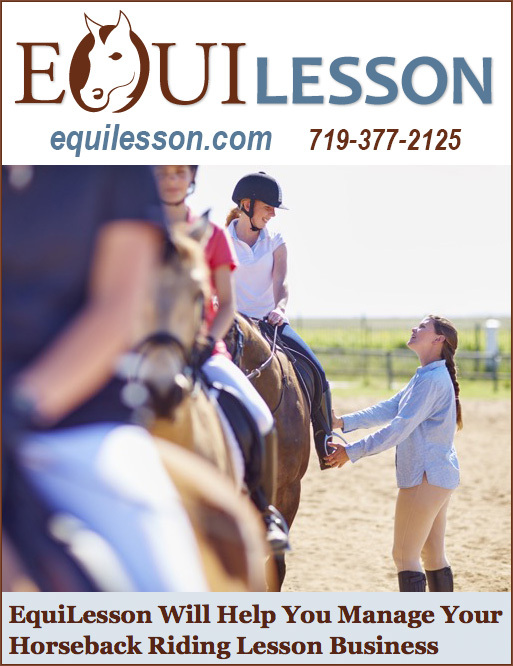 Whether you teach English, Western or just give riding instructions to clients at your Dude Ranch or Horse Camp, EquiLesson is for you. Can You Answer “Yes” To Any Or All Of These Questions? If So, EquiLesson Is For YOU! EquiLesson Can Save You Time— and Time Is Money! Allow customers to register and pay on-line. Save time by allowing them to answer their own questions on-line anytime. "What do I owe?" "When is my next lesson?" "Is there a group lesson available on Tuesday?" How Can EquiLesson Help Me Make More Money? So EquiLesson Can Help Me Manage My Business More Effectively? Absolutely! EquiLesson thinks of things you don’t have time to! Is It True That EquiLesson Makes It Easier To Communicate To Clients? Yes! Your students will appreciate your professionalism and consistency. But Will I Get Support To Help Me Set This System Up? Yes you will! We know that your expertise lies with riding instruction. We will walk you through the initial set up. We are with you every step of the way to ensure you are set up exactly the way that is best for you individual needs! You can be up and running today! How Much Does EquiLesson Cost? Your tax deductible EquiLesson Software starts at only $29 per month for up to 5 horses, $39 a month for up to 10 horses, and $59 a month for up to 25 horses— larger programs are available! If you wish to process credit card payments with our program, there is just a small additional fee as we are partnered with an excellent payment processing company…. the bottom line— EquiLesson is an AFFORDABLE, TAX DEDUCTIBLE expense that pays for itself. FREE training - we help with the initial setup and configuration to match your business processes and answer questions any time! Our month to month subscription only requires a 30 day notice to cancel and you can cancel at anytime. We thought you’d never ask. Just call us today and we’ll get you started. We can actually have your customized EquiLesson program up and running in a a few hours. This program is so wonderful you’ll never want to go back to your “scheduling book” again! EquiLesson is the business partner everyone loves to have! Call today!